Educational policy is often dismissed as simply rhetoric and a collection of half truths. However, this is to underestimate the power of rhetoric and the ways in which rhetorical strategies are integral to persuasive acts. Through a series of illustrative chapters, this book argues that rather than something to be dismissed, rhetorical analysis offers a rich and deep arena in which to explore and examine educational issues and practices. It adopts an original stance in relation to contemporary debates and will make a significant contribution to educational debates in elucidating and illustrating the pervasiveness of persuasive strategies in educational practices. 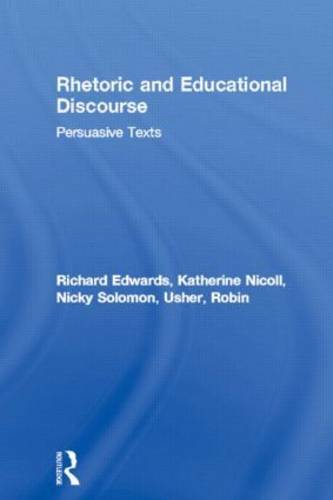 Rhetoric and Educational Discourse is a useful resource for postgraduate and research students in education and applied linguistics. The book will also be of interest to academics and researchers in these fields of study and those interested in discursive approaches to research and scholarship.